Tanya Coleman, center, is pictured with her daughter Kassandra and Meigs volleyball team members Maci Hood (6), Olivia Wyatt (5), Saelym Larsen (13), Baylee Tracy (1) and Hannah Durst (11). Tanya Coleman is presented a pink carnation at Thursday’s Volley for the Cure game at Meigs High School. Members of the River Valley volleyball team applaud as breast cancer patients and survivors are recognized on Thursday evening. 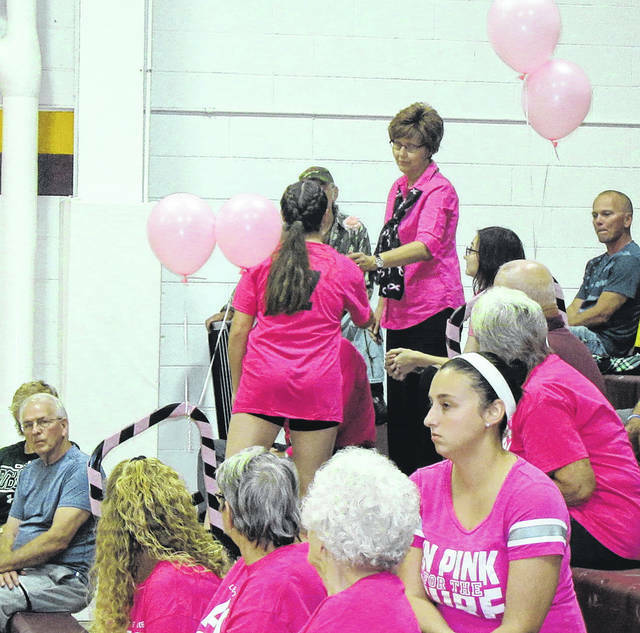 ROCKSPRINGS — As the calendar turns to October each year it seems that the color pink can be found almost everywhere and on Thursday evening the Meigs High School gymnasium was no exception. 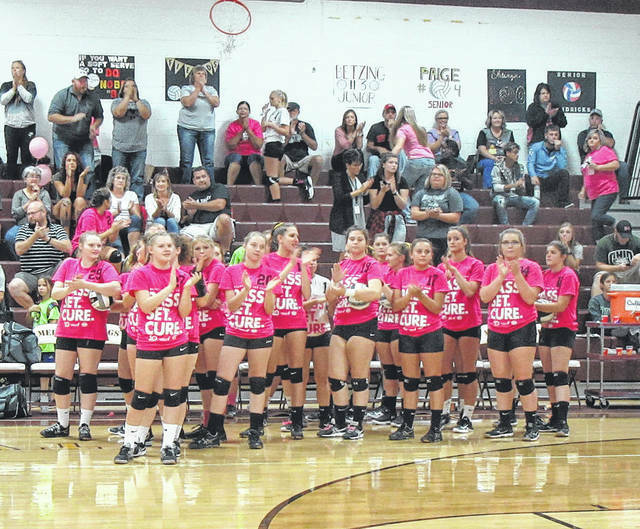 As the Meigs Lady Marauders volleyball team played host to River Valley, both teams wore pink in the annual Volley for the Cure game. Prior to the start of the varsity game, information was read about Breast Cancer, as well as a poem and quotes from breast cancer survivors. The pink shirts worn by the team during the game were purchased by the Tire Barn and Pizza Dan’s in honor of Tanya Coleman, who has been battling breast cancer for the past 10 months. Coleman was asked to stand as one team member presented her with pink carnations. All others battling breast cancer currently, who have battled breast cancer, or have had a family member who battled breast cancer were asked to stand and were presented with flowers. Coleman received her last radiation treatment on Thursday morning before returning to work for the afternoon. After the presentation Coleman talked with the Sentinel about her battle with breast cancer and her treatments over the past 10 months. Coleman said her diagnosis came late in 2016 after she noticed as spot which was sore. After a few days she called and made an appointment with her physician and a mammogram was scheduled. When she was told it was cancer, her son, who worked at Marietta Memorial Hospital at the time suggested a doctor there. After two weeks of testing, Coleman began treatment for what was Stage 2 breast cancer. She said it was the fast growing type. Chemo began on Dec. 22, 2016, with treatments until early June 2017. After a four week break she underwent a lumpectomy, with radiation starting on Aug. 22. At the halfway point of chemotherapy, the mass had shrunk in half said Coleman. Now, with treatments complete, Coleman will have followup appointments in the coming months and a mammogram in six months to recheck. Throughout her diagnosis and treatment, Coleman has continued to work at Farmers Bank in Mason as much as possible, despite the doctor not initially wanting her to work. While Coleman did work, she was “grounded” to her house other than work and doctor visits. Coleman said that the bank had been wonderful to work with her as she needed time off over recent months. She explained that she was used to going out and doing things with her family, including shopping trips with her daughter. It was much different having to stay home. She said the support of her husband, Gary, and children, Kassandra and Shaun, along with her sister had helped her to get through the treatments. “There is power in prayer,” said Coleman, thanking all of those who had offered prayers or support throughout the journey. As for attending the Volley for the Cure game on Thursday, Coleman explained that she had no idea she was going to be recognized by the team. 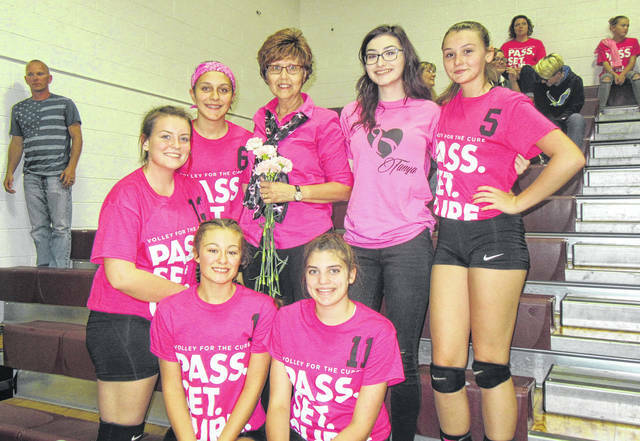 She said her daughter mentioned that it was the Volley for the Cure game at Meigs on Thursday evening, something they had attended for the past several years. https://www.mydailytribune.com/wp-content/uploads/sites/42/2017/10/web1_10.8-Coleman-1.jpgTanya Coleman, center, is pictured with her daughter Kassandra and Meigs volleyball team members Maci Hood (6), Olivia Wyatt (5), Saelym Larsen (13), Baylee Tracy (1) and Hannah Durst (11). https://www.mydailytribune.com/wp-content/uploads/sites/42/2017/10/web1_10.8-Coleman-2.jpgTanya Coleman is presented a pink carnation at Thursday’s Volley for the Cure game at Meigs High School. https://www.mydailytribune.com/wp-content/uploads/sites/42/2017/10/web1_10.8-Coleman-3.jpgMembers of the River Valley volleyball team applaud as breast cancer patients and survivors are recognized on Thursday evening.